to be sitting in a gin basket at Lockhouse’s downtown distillery. of Buffalo, New York are infectious. Lockhouse Distillery opened in 2013. It was the first operational distillery in the city in over 80 years, since American prohibition eradicated the once thriving industry. has reemerged as a different kind of grain hub. 26 breweries and six distilleries, Lockhouse included, now call Buffalo home. ‘the oxidation process helps,’ Cory adds. On the other side of a garage door inside the distillery is a bar that’s the first of its kind and serves as Lockhouse Distillery’s tasting room. The bar only serves New York produced beer, wine and spirits. You’ll find all six of Lockhouse’s flagship products, which include two of their four gins. orange, angelica, sage, grains of paradise, cardamom, cassia and marshmallow root. ‘If there’s something I don’t know or haven’t tried, I just rush towards it,’ Cory said, ‘that’s what brought me to marshmallow root.’ They started by tasting 30 botanicals macerated in their house spirit. When he tasted the marshmallow root, ‘I loved it and it made its way into the final batch because it had that little sweetness, little woodiness, without that bitterness that angelica has.’ Today that botanical library is up to 193. It takes up nearly an entire wall of their downtown Buffalo distillery space. The marshmallow root does gently shine through in their Fine Gin. A self-described ‘contemporary style’, it was designed for cocktails and to be a versatile base spirit behind the bar. was chosen because that was the lowest ABV at which it was clear in the bottle. Lockhouse’s Barreled Gin breaks with convention a bit in the aged gin space. Gin. It features an increased focus on the herbaceous and floral botanicals, so lavender is dialled up quite a bit. Lemon replaces the orange from their fine gin, and goes along with juniper, coriander, a touch of ginger, and some cardamom for added brightness. The wood notes certainly are aggressive in their aged gin with lots of vanillin and oak early, the finish blossoms with a surprising floral lightness, especially for an aged gin. Designed to be sipped on its own, it works well both neat and on the rocks. Sakura Gin is an annual limited-edition release, put out each spring after the Cherry Blossom Festival. In 2016 there was only enough blossoms to produce about 2,000 bottles, which sold out in weeks. It’s an absolutely stunning spirit with impressive balance. Despite cherry blossoms at the fore, there’s a slight citrus character and an easy spiciness from the cubeb berries that complements the juniper. With every bottle sold, Lockhouse Distillery donates to the Buffalo Olmsted Parks Conservancy for vacuuming privileges. Lockhouse Distillery produces one more private label gin exclusively for Buffalo cocktail bar The Angelica Tea Room. Cory approached them with a concept built around the eponymous ‘prolifically used botanical’. Angelica Gin was designed to be a house pour for the cocktail bar, although heavy with angelica, Cory described it as ‘more of a London Dry style,’ taking a more classic and accessible approach that can work in nearly anything. 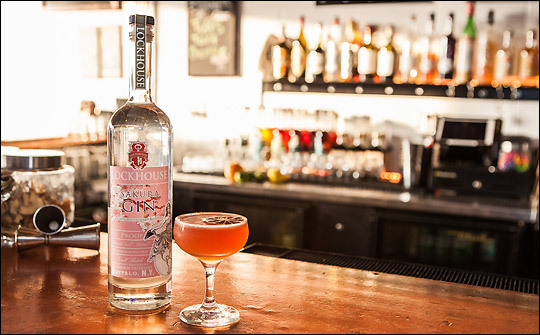 What’s next for Lockhouse Distillery is to continue focusing on their line of flagship products, their four gins, and maybe trying a few things that others haven’t yet. ‘We don’t want to follow the script. Everyone’s focusing on base spirits, we’re focusing on modifiers. Something you’ll add to the cocktail, that’s a modifier.’ Next time you make a Negroni with Lockhouse Gin, perhaps you’ll reach for their Ibisco Bitter too.